Kobelco Welding of America Inc.
· Kobelco Welding of America Inc.
Kobelco Welding of America, Inc. (KWAI) was established in Houston, Texas in 1990 as a wholesale company owned by Kobe Steel USA Holdings for marketing Kobelco welding consumables in North America and Latin America. Since KWAI launched its business. It has worked closely with all of its customers through quality services both in sales activities and technical support. Because of its outstanding business attitude, KWAI has earned rapid growth led by its excellent reputation and the distributor’s sales network expansion nationwide. 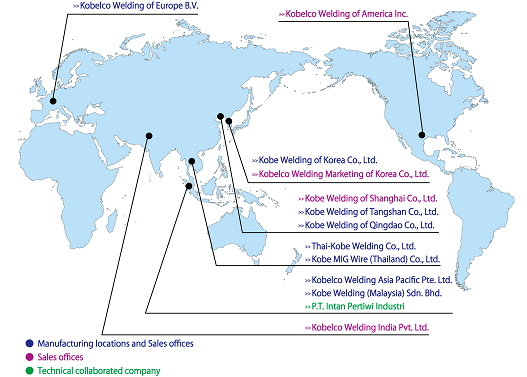 Today, more than 300 distributors are stocking Kobelco welding wires, mostly flux-cored wires, supplied from KWAI. KWAI’s stainless steel flux cored wires have earned the largest market share, 40%, in the North American market. KWAI has been pursuing customer satisfaction, through activities based on the business slogan QTQ (Quality products, Technical support and Quick delivery), targeting a higher market share. KWAI expanded its sales network by opening Cincinnati Distribution Center (1996), Chicago Distribution Center (1999), Philadelphia Distribution Center (2002), Salt Lake City Distribution Center (2002) and Birmingham, Distribution Center (2006). Kobelco Fluxed Cored Wire is of unsurpassed quality. That’s not just an idle boast or wishful thinking. Just ask any professional welder who has used Kobelco’s flux cored wires. Kobelco’s consistent quality begins in our welding R & D Department that is continually studying new materials and processes. New discoveries that result in flux cored wire with less spattering and easy slag removal.Our wires have excellent arc stability and smooth wettability that produce a beautiful bead…spool after spool. And you won’t have to worry about availability. Because we’re the Welding Company of Kobe Steel, our warehouses are always well stocked to meet your needs. In many cases, an order placed today means it will be delivered tomorrow, not weeks or months from now. Website designed by SunNet Solutions. Copyright © 1995-2019 KOBE STEEL., LTD. All rights reserved.